Grim Dawn exceeded expectations with a meaty main quest and classic ARPG gameplay. Alright, so it’s been awhile since my last Rogue’s Adventures update. I was worried at the start of this Season (back in January) that I’d have less time to devote to backlog gaming. Well, I was right. Things got even worse when we up and decided to sell our house and buy a new one in May, which has pretty much turned my entire Summer upside down! So a 25 hour game suddenly took me 2.5 months to complete. This Season was supposed to last until the end of June, and here we are in August. Excuses, excuses. Suffice to say that major changes to my backlog gaming format (which has been going strong since Fall 2012) will be Coming Soon. But first, I have a Final Thoughts to get to. 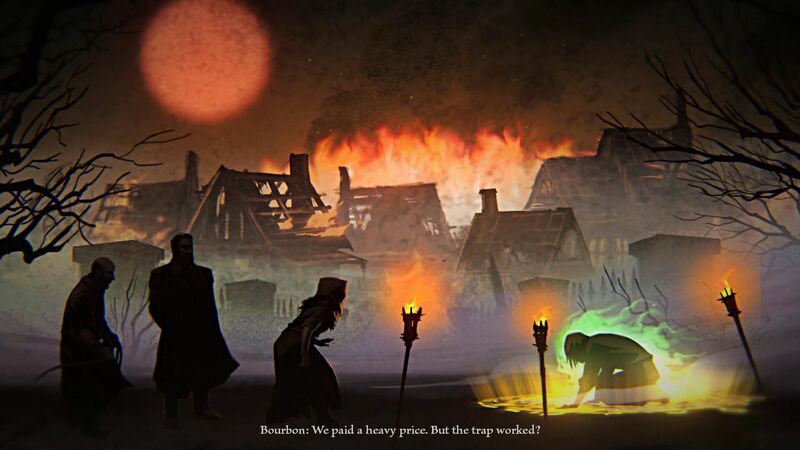 Grim Dawn was one of my oldest Kickstarter games, having backed it back in 2012, just after Double Fine blew up Kickstarter with what would become Broken Age. I was a big fan of Titan Quest back in the mid 2000s, easily my favorite non-Diablo Diablo game. To have a spiritual successor, even after the then-newly launched Diablo 3 was just too good to pass up. Fast-forward about four years later. Even for Kickstarter indie games that’s a solid chunk of development time. Thanks to half-million or so raised and some wise pacing, Grim Dawn nicely exceeded expectations with a meaty main quest and classic ARPG gameplay. While Titan Quest delved into multiple classic mythologies, Grim Dawn fancies itself with good old fashioned Cthulhu-esque demons and blood rituals. If it’s an attempt to get back to the dark, Gothic roots of the first Diablo, it mostly succeeds. The overall palette is exceptionally dark and muted. Dungeons are littered with blood-soaked torture chambers. Journals left behind detail the creeping madness of regular folks as dark forces take hold. The world of Cairn is actually pretty mundane. Some swamps and snowy mountains dot the landscape. Otherwise it’s a whole lot of forests, farmlands, and caves. The early game, with weak enemies and limited skills, is particularly boring. Individual areas are enormous, acting as both a blessing and a curse. It’s fun to have so much content and opportunity to explore, and a great map means you never get lost. On the other hand, backtracking through large, maze-like areas can be a tedious slog, and waypoints are annoyingly spaced out. 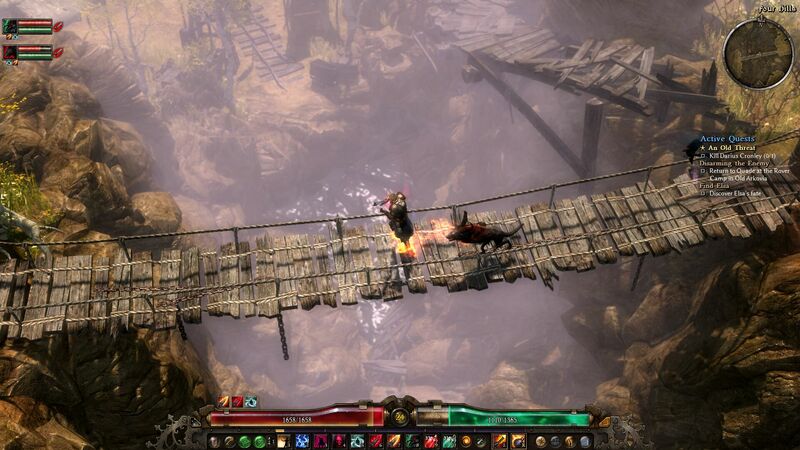 A green corruption spreads around later parts of the game, creating a unique environmental hazard that reminded me of Divinity: Original Sin. The world is mostly linear with a few side treks and optional areas. I appreciated the quest system that always pointed out where to go, while just the right amount of side quests gave me enough things to do in each area. Several factions exist in Cairn, and you have to earn reputation with each one in order to purchase their best stuff. Cozy up to them by killing the enemies in the area and completing quests and you’ll unlock their Bounty Table. These bounties let you take on randomly generated quests to go kill things – not unlike Diablo 3‘s Adventure Mode. It’s nice that it’s available right there in the main campaign, though it takes a while to grind up enough reputation to open them up. Also I have no idea why enemies also have a faction rating. “You are now Despised with Undead!” Okay? The writing is solid, and the few voiced characters are well-acted. But the dark story takes itself extremely seriously. In the end, this is a loot-driven, skill point based adventure that’s all about builds, suitability, and damage potential. 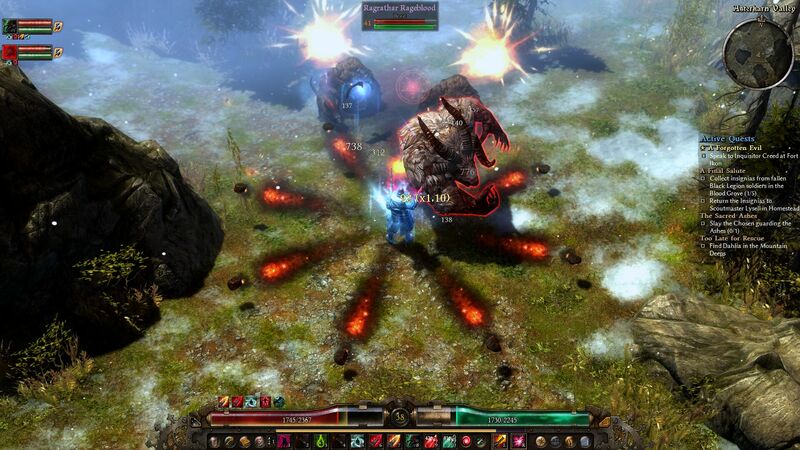 Diablo 3 represented a shift in the ARPG paradigm. It eschewed skill points, eventually rewarding you with every skill variation after leveling up. It was 100% loot focused. Now, I really like Diablo 3. Even more so after the incredible amount of post-game support it’s received over the years. But Grim Dawn is a proud member of the old school crowd that Path of Exile adheres to. Like Titan Quest before it, you get three skill points every level up, and a bevy of choices. You initially select a class from six Masteries. Then upon reaching level 10, select a second Mastery. This lets you mix and match skill types and play styles into a unique death-dealing machine. For my playthrough I started with Demolitionist, a class that specializes in mechanical devices and guns. Guns! Grim Dawn takes place in a more steampunk/renaissance world than most fantasy-based Action-RPGs. I hefted a large rifle for the first half, then switched to dual pistols after finding a special Gunslinger’s Jacket that enabled dual wielding. For my second choice I grabbed Occultist, giving me some nifty demon pets. My class became the Pyromancer, and I turned my bullets into liquid fire of explosive destruction. It was a good thing. Unfortunately much of character planning and building involves passive skills that simply make you stronger in your chosen field. While it’s satisfying to match up loot and skills to maximum potential, having a bunch of passive skills means you’re not doing all that much in combat. And in Grim Dawn, like any ARPG, you’re in combat the whole damn time. By the end game I was throwing single points into random skills just to give me more things to do. It may have been my particular glass cannon build, but I suspect that most successful builds in the game would involve a hefty dose of passive buffs. Devotion points were a unique addition that I loved, but ultimately felt terribly underused in a single playthrough. They were modeled after a combination of Skyrim‘s constellation skill trees and Path of Exile’s insane spider-web of skills. Devotion Shrines were scattered around the world, and required either certain monster loot drops or a combat challenge to unlock. Doing so rewarded you a point that you could spend among these stars, almost all of which lead to further passive buffs. However, most constellations gave a unique skill if you completely filled them out. They were also divided into six different types, with stronger constellations requiring a certain amount and type of previous Devotions. It added an additional layer of complexity to character building that I warmed up to, and soon had a cool path laid out. Unfortunately when I beat the game I had only acquired about half the Devotion points – and I know I didn’t miss half the game. Not sure if you have to go back through a harder difficulty but I was disappointed that I never reached the upper echelon of the cooler skills. 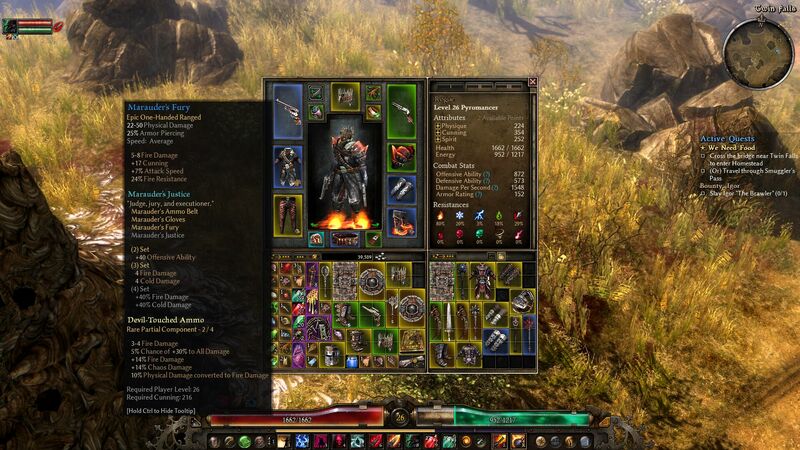 Skill planning was important but Grim Dawn is still all about the loot. It did a great job iterating and building upon previous games in the genre. 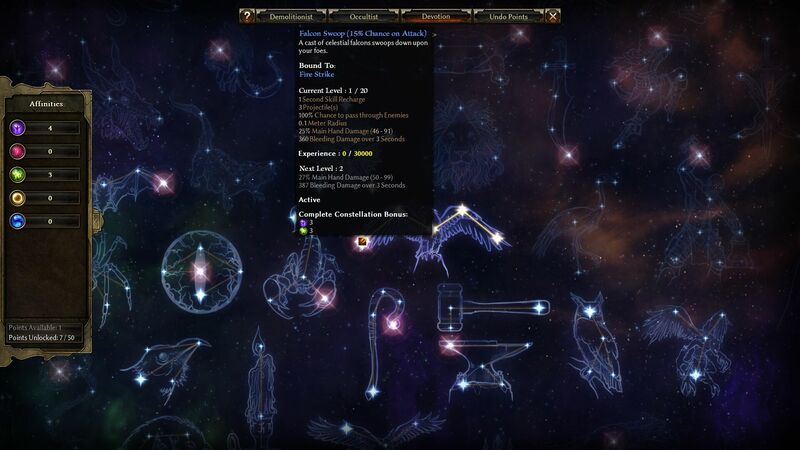 Dozens of small monster drops could be combined and socketed into any items. Magic items, Uniques, Set items, and even Legendaries (which I literally didn’t see until I beat the final boss on Normal) were all there. Crafting, recipes, storage (with item transfer), and multiple backpack slots were par for the course. I was impressed with how long items could last – I wore that Gunslinger’s Jacket throughout the entire second half of the game, but that also underscored the importance of loot. An ARPG needs to feed you that steady drip of fighting and looting. Crate knows how to craft a solid ARPG experience. 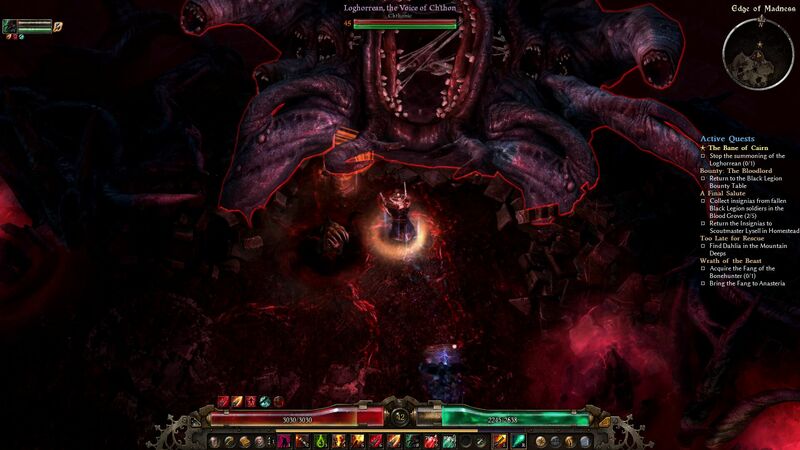 As a spiritual successor to Titan Quest, Grim Dawn is a lot of fun. But its limited indie roots definitely bleed through. The Titan Quest engine is gussied up but does look dated. Enemies are not nearly as varied or interesting as I would have liked, and far too many are simply humans. Yet, Grim Dawn has that satisfying kill-loot-repeat cycle down solid. It may not be the most memorable experience but Grim Dawn provides a satisfying evolution of Titan Quest, and a worthy entry to an increasingly crowded genre. Final Say: Several great concepts and solid gameplay make this indie ARPG a worthy successor to Titan Quest.